The Free Syrian Army (FSA) has completed the majority of its preparations for a possible operation launched by Turkey in the northern Syrian town of Manbij, and are awaiting orders approximately 70 kilometers away from the city. A force of 12,000 FSA troops – 3,000 of whom are Manbij locals – are waiting for Turkish President Recep Tayyip Erdoğan to initiate the operation. Erdoğan has stressed that Turkey was ready to take all necessary measures in case of a possible threat to the country. Turkey and the United States have reached "an understanding, not an agreement" over Manbij, Turkish Foreign Minister Mevlüt Çavuşoğlu said last week. If an agreement is reached between Ankara and Washington, the numbers of the FSA force will be reduced by half. Hundreds of towns living under the occupation and oppression of the Kurdistan Workers’ Party (PKK) have made calls to Turkey saying, “Save us.” The latest message came from Abdulkerim el Fahhel, one of the important tribal chiefs of Manbij. Fahhel said that locals in Syria are looking forward to welcoming the Turkish Armed Forces (TAF) and Free Syrian Army (FSA) with flowers.The Kurdish Tribal Association in Syria in an official declaration on Saturday stated that they wanted the presence of the TAF and FSA in all PKK-occupied territories.Leave ManbijIn a letter to PKK and Democratic Union Party (PYD) terrorists, el-Fahhel wrote, “Leave Manbij.” He also mentioned that some tribal members were released from the prisons of Raqqa because the terrorists were outmaneuvered.Full support of Turkish military “The people of Manbij want the Turkish military to take control, just as they did in Afrin. The Turkish military targets the PKK/Daesh terrorists and not civilians,” el-Fahhel said. “Civilians ask when will they obtain freedom from the PKK/PYD terrorists. The Turkish military will have full support of the public during the Manbij operation,” he added.They want our homes and landsAbdulkerim El-Fahhel, who represents seventy percent of the tribal Manbij population, stated that the PKK/PYD terrorist organization occupied the villages in Manbij and its so-called leaders had confiscated and seized control of the homes and farms of locals. El-Fahhel said that the PKK/PYD terrorists force people to protest against the TAF and FSA and arrests those who do not oblige.Thousands martyred“More than four thousand have been martyred in the fight against PKK/PYD/Daesh terrorists” and “Americans should also leave the region along with PKK/PYD terrorists,” he said. “We want the TAF and FSA to control the security of the region and US soldiers are not welcome here,” he added.Protests against PKK/PYD terroristsSyrian residents of Tal Rifaat city in the northern Aleppo province held a rally on Saturday demanding an Afrin-type Turkish military operation against the PKK/YPG terrorist group in their city.Protesters blocked the road between Azaz city and Sijo town amid calls for Turkey’s Operation Olive Branch to include Tal Rifaat.The PKK is listed as a terrorist organization by Turkey, the European Union and the United States. The PKK has been conducting armed violence in the southeastern part of Turkey since 1984. More than 40,000 people, mostly civilians, have been killed in the three-decade long conflict. As a result of its geography, an operation in Manbij would be conducted more easily than was done so in Afrin. The Turkish Armed Forces (TAF) and FSA are aware of the tunnels built by the Kurdistan Workers' Party (PKK) and its Syrian affiliates, the points where heavy weapons provided by the U.S. are located and the number of terrorists. The Democratic Union Party (PYD) and its armed wing the People’s Protection Units (YPG), which were swiftly defeated in Afrin, have suffered a great blow to their morale and their grip on the region has been severely weakened. On March 18, Turkish-backed troops liberated the town center of Afrin, followed by security sweeps for mines, improvised explosive devices, and terrorist hideouts as part of Operation Olive Branch. The residents of Tal Rifaat in northern Aleppo and many Free Syrian Army (FSA) members asked Turkey to help liberate their lands from YPG/PKK terrorists.Around 500 people, including civilians and members of FSA, asked Turkey to extend its Operation Olive Branch to Tal Rifaat city.Turkey launched Operation Olive Branch on Jan. 20 to clear terrorist groups from Afrin, northwestern Syria amid growing threats from the region.They chanted slogans against YPG/PKK terrorist group, and thanked Turkey for its operation in Afrin region.Video: Syrian locals ask Turkey to help clear Tal RifaatGaleri: Syrian locals demand Turkey clear YPG/PKK from Tal RifaatCarrying Turkish and FSA flags, they were also holding banners which said: “We are looking forward to Tal Rifaat operation of Free Syrian Army backed by Turkish Armed Forces.”In early 2016, YPG/PKK terrorists used Russia’s intense air support at a time when its ties with Turkey were tense, and had the opportunity to spread to the southeast from Afrin.During its invasion of Tal Rifaat, the YPG/PKK forced around 250,000 Arabs out. Residents of the city sought refuge in Azaz, which is adjacent to the Euphrates Shield area and is under opposition control.The terrorists started to accommodate Kurdish families in Tal Rifaat who they brought from Afrin. Currently, around 15,000-20,000 Kurds and Arabs live in the district and only 700-800 of them are Arab residents of Tal Rifaat.Speaking at a ruling Justice and Development (AK) Party provincial congress on Sunday, President Recep Tayyip Erdogan said: “God willing, we will achieve this operation’s goal by taking control of Tal Rifaat within short order.”On Saturday, Syrian residents of Tal Rifaat staged another rally to demand a Turkish military operation against the YPG/PKK terrorist group in the city. FSA sources indicate that the PKK/PYD-YPG have stationed weapons provided by the U.S. across various points of Manbij, and that the terror tunnels in Manbij will fail to protect them, just as it failed in Afrin. The terrorist organization built tunnels at Manbij but they are smaller than those in Afrin. The FSA have completed map preparation for the Manbij operation, and knows where terror bases and various sized tunnels are located. 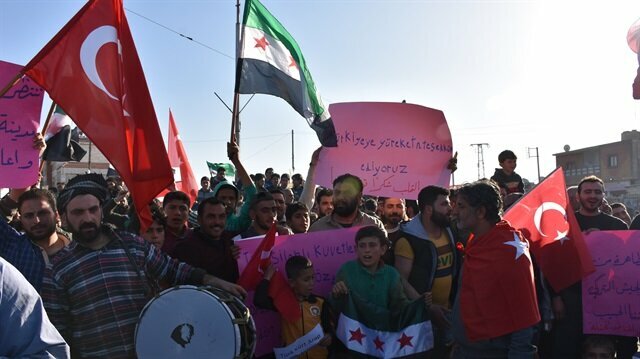 Tal Rifaat residents and Free Syrian Army members stage a demonstration to ask Turkey to extend its operation to Tal Rifaat in northern Aleppo, Syria on March 26, 2018. Taking into account the mountainous terrain and unfavorable weather conditions, Afrin was cleared of terror elements in 58 days. However, Manbij is geographically flat. FSA forces say that the region can be liberated in 10 days if the U.S. withdraws its support from the PKK/PYD-YPG. The preparations of the terror group such as thick concrete reinforced walls and rooms like in Afrin are not found in Manbij. It is reported that these elements will accelerate the completion of the possible operation. 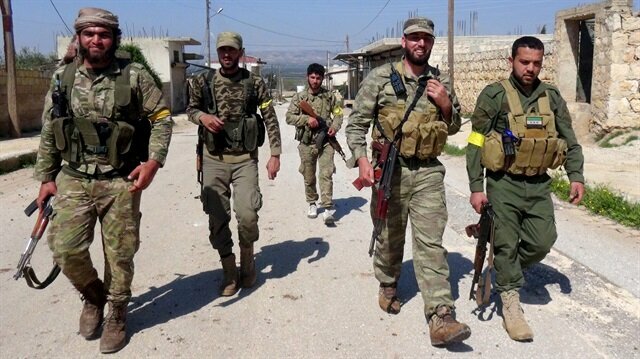 There are approximately 400 terrorists who came to Manbij from Qandil, and 2,000 terrorists local to the region. It is assumed that once the TAF initiates the operation, “terrorist support” from Raqqa, Kobani and al-Hasakah may arrive. A total of 3,755 terrorists have been "neutralized" since the start of the Turkish-led Operation Olive Branch in Syria's Afrin region, the Turkish deputy prime minister and government spokesman said on Monday.Turkish authorities often use the word "neutralized" in their statements to imply that the terrorists in question either surrendered or were killed or captured.Speaking after the cabinet meeting in Ankara, Bekir Bozdag said "282 villages, 50 strategic points and 332 locations were taken under control" by the Turkish and Free Syrian army.Bozdag stated that Turkey’s actions in Afrin were not finished.Bozdag said no civilian was harmed, stating that the mine and explosive searches continued to provide security for the civilians in the region.Stating that Turkey was supporting nearly 40,000 civilians in 106 locations in the Afrin region, Bozdag said Turkish organizations such as the Turkish Red Crescent, the Disaster and Emergency Management Authority (AFAD) and the Diyanet Foundation continued to provide humanitarian aid.Turkey will continue to provide medical support to the region, Bozdag added.Turkey will not act against Russia, says deputy PMErdoğan: EU expansion without Turkey 'grave mistake'Turkey-EU summitHe also addressed the Turkey-EU Summit held on Monday under the leadership of Turkish President Recep Tayyip Erdogan, European Council President Donald Tusk and EU Commission President Jean-Claude Juncker in Varna, Bulgaria.“We hope that this summit will open a new door, the relationship will gain a new acceleration,” he said.During the summit, several matters relating to Turkey-EU relations, economy, counterterrorism, foreign policy, Palestine, the Balkans, Syria, Iraq and Libya will be discussed.